Every time you get in the car it is a risk. You are risking your life to get to your destination. It is well known that traffic accidents are one of the leading causes of injury-related deaths in the US (second only to suicide). But what if there was a way to avoid the roads that have the highest rates of fatal crashes? Would you reroute your commute to avoid these roads? Sure! But how do I know what roads to avoid? I’m glad you asked. The website riskyroads.org has done all of the legwork for you. 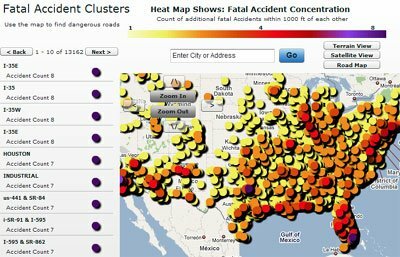 They have taken statistics about fatal crashes from the National Highway Traffic Safety Administration and collaborated them to rank each major freeway in the country. They have ranked the roadways on a scale of 1-8, with eight being the worst. How do they rank the roads? They look at where all of the fatal accidents happen. If there are several accidents on the same road within 1,000 feet of each other, the road will receive a higher rating. The map of the country is then color-coded so that it is very easy for you to determine where the dangerous areas are in your city. Basically, any red or purple areas you will want to avoid if possible. Just because someone got in a crash there doesn’t mean I will. That is very true. While distracted driving or speeding can occur anywhere, there are often other factors in play. Does the road have a really sharp turn? Is the road located near a popular bar, resulting in a higher occurrence of drunk drivers? Is the speed limit too high for the street conditions? Is the area simply a magnet for terrible drivers? The high rates of fatal accidents on particular streets probably happen for a reason. If they were a mere coincidence they wouldn’t keep happening in the same spot. So if I avoid those roadways I will be safer? Of course, you can never guarantee when or where you will or will not get in an accident. But if you can reroute your commute to avoid these roads, you probably have a better chance of reaching your destination. If it adds a lot of time to your commute, it is probably not worth it. You will just want to make sure to drive extra defensively and follow all of the laws to ensure your safety. However, if you can alter the route you take without adding too much time to your commute, it may be worth a change. Sure, you may take a few more minutes to get where you are going, but at least you will get there safely.